Time: 9:30 a.m. - 6:30 p.m.
Robotic automation has rapidly become a hot topic among business process experts. Embracing the era of robotics, an increasing number of forward-thinking businesses have embarked on a new journey to streamline operations and improve productivity by adopting innovative technologies such as robotic process automation (RPA). 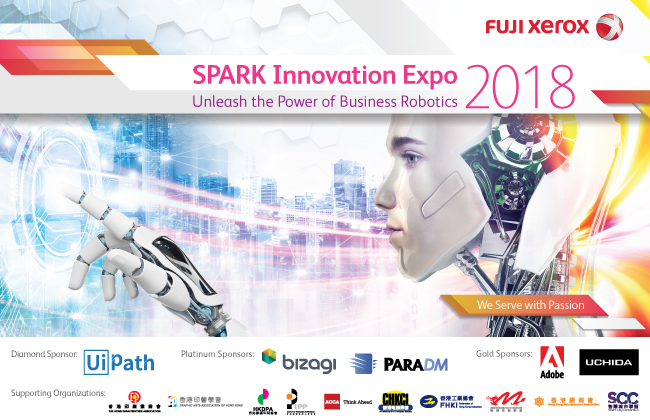 To deepen your understanding of business robotics and its benefits, Spark Innovation Expo 2018 will be held on 21 November, 2018 to provide you with the latest trends on business robotics and, most importantly, some actionable insights to take home. Digital transformation is about humans. By freeing employees from repetitive tasks to concentrate on strategic work, digital transformation to business robotics help unleash the potential of human workflow while enhancing customer satisfaction by offering speedy service. With a proven track record in improving business efficiency and profitability, we are pleased to C-suite speakers from notable multi-nationals to share their practical experience in robot applications and robotic process automation, and how they overcome the real-life challenges and setbacks. Digital transformation is a long-term investment. What are top management's major concerns about digitalization of data? How does it affect employees? The seminar will also shed light on top management's views and Fuji Xerox (Hong Kong)'s cost-effective solutions, available to all small and mid-sized businesses. To be held at the Smart Office and Smart Manufacturing Area, the exhibition will also offer visitors an innovative journey about our latest solutions and technologies. The exhibition is divided into various zones, including: smart office, corporate sustainability and analytics, robotic business process, secure IT infrastructure, business transformation and customer communications. Save the date! Register now to win amazing prizes! The first 100 registrants who attend the event will receive a gift! © Fuji Xerox (Hong Kong) Limited. All rights reserved. Xerox, Xerox and Design, as well as Fuji Xerox and Design are registered trademarks or trademarks of Xerox Corporation in Japan and/or other countries.